Ya saben que cada tanto me gusta compartir alguna receta saludable. Ultimamente estoy aprendiendo mucho sobre la alimentación sana, y para mi sorpresa (porque nunca me gusto cocinar) estoy cocinando muchísimo y descubriendo sabores e ingredientes nuevos. Hoy les comparto unas Cookies Raw de frutos secos, riquísimas, muy fáciles de hacer y muy nutritivas. La receta la saque del blog Texturas de Verduras, que está lleno de recetas saludables. Procesar todo, esta bueno que queden algunos pedazos mas grandes que otros. Formar bolitas con las manos y achatar dando forma de “cookie”, luego pasarlas por coco rayado. Como a mi no se me unía bien la masa, le agregué un chorrito de aceite de coco. Salen aproximadamente 10 galletitas. Yo las guardo en un tupper en la heladera y las como a la noche mientras tomo mi te verde! Son todo alimento, sin azucar agregada, manteca o harina. Espero que les guste! From time to time I like to share with you a healthy recipe. I’ve been learning and reading a lot about healthy cooking and, to my surprise, I’ve been cooking a lot, discovering new ingredients and flavors. 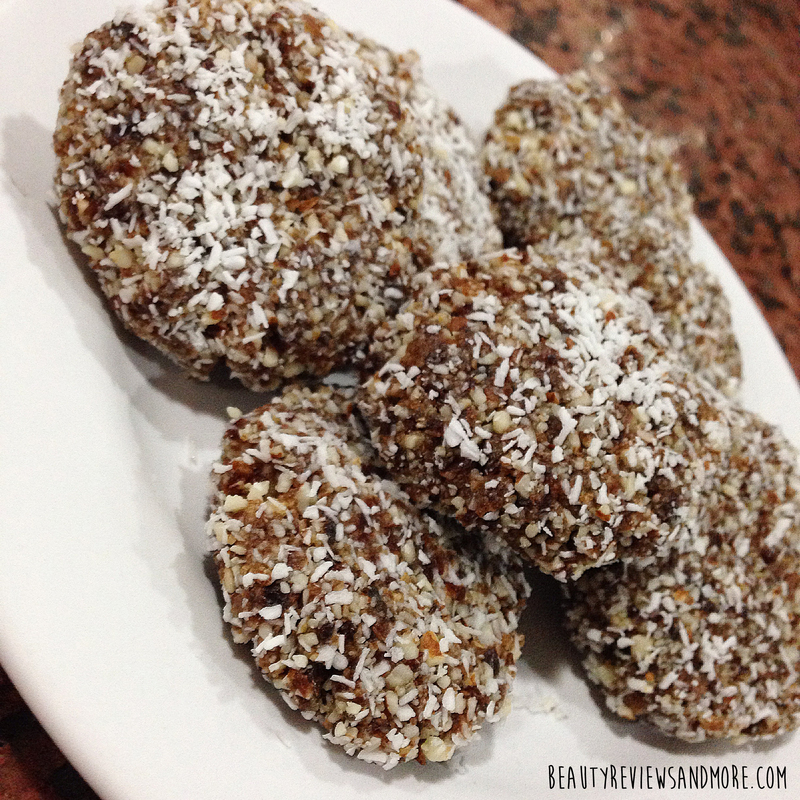 This is a very easy recipe to make Raw Cookies with almonds, very tasty and nutritious. I got the recipe from and amazing blog called Texturas de Verduras. Process everything and form little balls with your hands, giving them a “cookie shape”. Roll in shredded coconut. I had some trouble keeping all the ingredients together so I added a little bit of coconut oil to the mixture. You’ll get about 10 cookies. I keep them in an airtight container in the fridge, and eat them at night with my green tea! They are very nutritious, with no added sugar, butter or flour! Hope you like them! Siguiente Coca-Cola Shoes Party, diseño y mucho color!